Carson Ellis is the author-illustrator of the New York Times bestseller Home, her debut solo picture book. She is also the illustrator of The Composer Is Dead by Lemony Snicket and Dillweed’s Revenge: A Deadly Dose of Magic by Florence Parry Heide, and she collaborated with her husband, Colin Meloy, on the best-selling Wildwood series. Carson Ellis lives with her family outside Portland, Oregon. Carson Ellis has created a fantastic microcosm with her usual grace and inventiveness...I was completely captivated by Ellis’s wonderful creatures, their charming little world and their droll language. Ellis (Home, 2015) elevates gibberish to an art form with her brilliant account of a few bugs, who discover a green shoot sprouting from the ground...Readers and pre-readers alike will find myriad visual cues in Ellis’ splendid folk-style, gouache-and-ink illustrations that will allow them to draw meaning from the nonsensical dialogue, as well as observe the subtle changing of the seasons. The entire story unfolds on the same small stretch of ground, where each new detail is integral to the scene at hand. Effortlessly working on many levels, Ellis’ newest is outstanding. Viewers follow the unfurling of an exotic woodland plant through the actions and invented language of beautifully coiffed and clothed insects...This is certain to ignite readers' interest and imaginings regarding their natural surroundings. Following the minute changes as the pages turn is to watch growth, transformation, death, and rebirth presented as enthralling spectacle. Ellis’s (Home) bewitching creation stars a lively company of insects who speak a language unrelated to English, and working out what they are saying is one of the story’s delights...Very gently, Ellis suggests that humans have no idea what wonders are unfolding at their feet—and that what takes place in the lives of insects is not so different from their own. Has there ever been anything quite like it? Ma nazoot. It’s a genuinely charming story with brain-tickling interest from the dialogue, and it earns a satisfying edge from the silent and decisive victory over the spider. Ellis is best known as an illustrator, and her oversized gouache and ink spreads deftly balance playfulness and precision, intricacy and airy background...Readers-aloud will want a practice run to ensure their intonation carries the meaning of the words, but it will all make perfect and pleasing sense to imaginative listeners. Using intricate illustrations supported by spare dialogue in an invented language, Ellis elegantly weaves the tale of several square feet of ground in the insect world as the seasons pass...This is a title that calls for multiple readings, as there is something new to be discovered each time. Perfect for one-on-one or small group sharing. Ellis’ precise and detailed illustrations of bespectacled bugs and an elaborate fort utterly beguile...It would be easy to make such a story clever for the sake of being clever, but instead Ellis has created one of the smartest, most original and most endearing picture books of this year. Du iz tak? It’s a keeper is what it is. 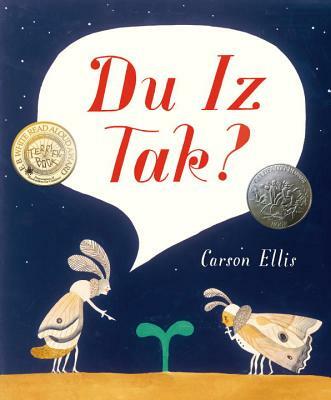 Written entirely in the playful and amusing language of bugs, it isn't necessary to speak fluent moth or ladybug to enjoy the growth and metamorphoses creatively combined through Carson Ellis's delightful words and fanciful illustrations as the seasons subtly transform. With minimal text and crisp images, Ellis's book is deceptively simple, but don't be fooled; this whimsical story requires a close reading to truly absorb all its subtle delights. Here's a bright, refined fantasy world to be lost in, and one that has its dark, seasonal drama to boot. Good for kids who like to imagine miniature worlds.